Selected relevant SEA Massif publications from the lab. Names written in full are current or former lab members. Smyer Yu, D. and Jean Michaud (eds, 2017) Trans-Himalayan Borderlands. Livelihoods, Territorialities, Modernities. Amsterdam University Press, Amsterdam. Michaud, Jean; M. B. Ruscheweyh; M. B. Swain (2016) Historical Dictionary of the Peoples of the Southeast Asian Massif. Second Edition. Lanham, Boulder, New York, London, Rowman & Littlefield, 594p. Turner, Sarah, Christine Bonnin and Jean Michaud (2015) Frontier Livelihoods. Hmong in the Sino-Vietnamese Borderlands. University of Washington Press, Seattle. 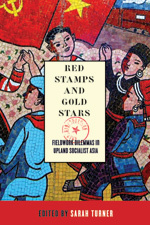 Turner, Sarah (Ed), (2013) Red Stamps and Gold Stars: Fieldwork Dilemmas in upland Socialist Asia. UBC Press, Vancouver. De Koninck, R. and Jean-François Rousseau (2013) Gambling With the Land: The Contemporary Evolution of Southeast Asian Agriculture. NUS Press, Singapore. 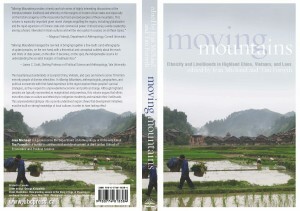 Michaud, Jean and T. Forsyth (Eds), 2011: Moving Mountains: Livelihoods and Ethnicity in upland China, Vietnam and Laos. UBC Press: Vancouver. 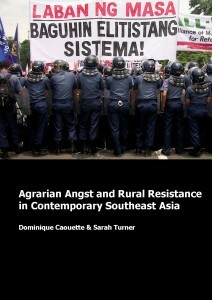 Caouette, D. and Sarah Turner (Eds), 2009: Agrarian Angst and Rural Resistance in Contemporary Southeast Asia. Routledge: London. Rousseau, Jean-François. & O. Durand. (eds.) 2009. Une seule terre à cultiver, les défis de l’agriculture et de l’alimentation mondiales. Québec: Presses de l’Université du Québec. Michaud, Jean 2007: ‘Incidental’ Ethnographers. French Catholic Missions on the Tonkin-Yunnan Frontier, 1880-1930. Leiden & Boston: Brill Academic Publishers. 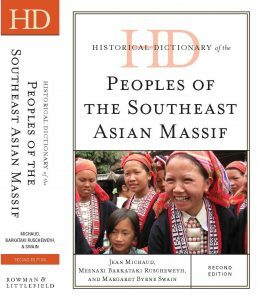 Michaud, Jean 2006: Historical Dictionary of the Peoples of the South-East Asian Massif. Lanham (MD): Scarecrow Press. Tapp, N., Michaud, Jean; Culas, C. and G. Y. Lee (Eds) 2004: Hmong/Miao in Asia. Chiang Mai: Silkworm Books. Michaud, Jean (Ed.) 2000: Turbulent Times and Enduring Peoples. The Mountain Minorities of the South-East Asian Massif. London: Curzon Press. Henein, Y. T-T-H Pham, and S. Turner (in press) A small upland city gets a big make-over: Local responses to state ‘modernity’ plans for Lào Cai, Vietnam. Urban Studies. Michaud J., 2018. “Zomia and Beyond.” In M. Saxer, A. Rippa & A. Horstmann (Eds) Routledge Handbook of Asian Borderlands. London: Routledge. Rousseau, J.F. & Turner, S. 2018: Not at all costs: Frontier modernization schemes and ethnicminority livelihood debates in the Sino-Vietnamese borderlands. Verge – Studies in Global Asias, 4 (1), 133-159. Turner, S., and Ngô Thúy Hạnh, 2018 (early view). Contesting socialist state visions for modern mobilities: Informal motorbike taxi drivers’ struggles and strategies on Hanoi’s streets, Vietnam. International Development Planning Review. Eidse, N., S. Turner and N. Oswin, 2017. Contesting Street Spaces in a Socialist City: Itinerant Vending-Scapes and the Everyday Politics of Mobility in Hanoi, Vietnam. In: Mei-Po Kwan and Tim Schwanen (eds) Geographies of Mobility. Recent advances in theory and method. Chapter 10. Routledge: London. Michaud, Jean, 2017: What’s (written) history for? Anthropology Today. 33(1): 6-10. Michaud, J. 2017 “法国殖民军事民族志记录中的越南北部 边境生计ꎬ 1897-1904” [Livelihoods in the Vietnamese Northern Borderlands Recorded in French Colonial Military Ethnographies 1897-1904], translated by Zhang Min张敏译. In Dan Smyer Yu, Li Yunxia and Zeng Li, eds. 环喜马拉雅区域研究编译文集一——环境、生计与文化 [Trans-Himalayan Studies Reader Vol.I: Environment, Livelihood and Culture]. 学苑出版社 [Beijing: Academy Press], pp.240-266. Michaud, J. 2017. “佐米亚及其影响力” [Zomia and Beyond], translated by Chen Jianhua and Tan Liying (陈建华、谭丽赢译). In Dan Smyer Yu, Su Faxiang and Li Yunxia, eds. 环喜马拉雅区域研究编译文集二——佐米亚、边疆与跨界 [Trans-Himalayan Studies Reader Vol.II: Zomia, Frontiers and Borderlands]. 学院出版社 [Beijing: Academy Press] pp.12-46. Michaud J., 2017. “Adjusting Livelihood Structure in the Southeast Asian Massif.” Pp.45-64; and “Conclusion: Frictions in Trans-Himalayan Studies.“ Pp.285-98. In Smyer Yü, Dan & J. Michaud (Eds). Trans-Himalayan Borderlands: Livelihoods, Territorialities, Modernities. Amsterdam: Amsterdam University Press. Michaud J., 2017. Comment on Jinba Tenzin (PDF, 867 Ko), 2017, “Seeing Like Borders: Convergence Zone as a Post-Zomian Model.” Current Anthropology. 58(5). Michaud, Jean, and Sarah Turner, 2017: Reaching new heights. State legibility in Sa Pa, a Vietnam hill station. Annals of Tourism Research. 66: 37-48. Rousseau, Jean-François, 2017: Does carbon finance make a sustainable difference? Hydropower expansion and livelihood trade-offs in the Red River valley, Yunnan Province, China. Singapore Journal of Tropical Geography, 38(1): 90-107. Turner, S. 2017. A fortuitous frontier opportunity. Cardamom livelihoods in the Sino-Vietnamese Borderlands. 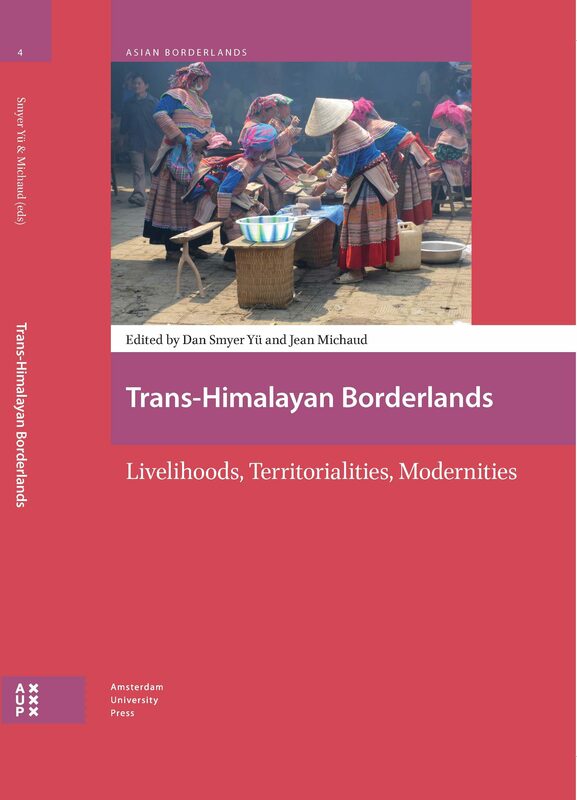 In D. Smyer Yü and J.Michaud (eds) Trans-Himalayan Borderlands Livelihoods, Territorialities, Modernities.Amsterdam University Press: Amsterdam, pp 263-284. Turner, S. 2017. Ethnic minorities, indigenous groups and development tensions. In A. McGregor, L. Law, F. Miller (eds) Routledge Handbook of Southeast Asian Development. Routledge: London. Chapter 18. Turner, Sarah., A. Derks, and Ngô Thúy Hạnh 2017: Flex crops or flex livelihoods? The story of a volatile commodity chain in upland northern Vietnam. Journal of Peasant Studies. Delisle, Sarah. and Sarah Turner 2016: ‘The weather is like the game we play’: Coping and adaptation strategies for extreme weather events among ethnic minority groups in upland northern Vietnam. Asia Pacific Viewpoint, doi: 10.1111/apv.12131. Eidse, Noelani, Sarah Turner, and N. Oswin, 2016: Contesting Street Spaces in a Socialist City: Itinerant Vending-Scapes and the Everyday Politics of Mobility in Hanoi, Vietnam. Annals of the Association of American Geographers, 106 (2) 340–349. Kyeyune, Victoria and Sarah Turner 2016. Yielding to high yields? Critiquing food security definitions and policy implications for ethnic minority livelihoods in upland Vietnam. Geoforum, 71, 33–43. Michaud, Jean. and Sarah Turner 2016: Tonkin’s uplands at the turn of the 20th century: Colonial military enclosure and local livelihood effects. Asia Pacific Viewpoint 57 (2), 154-167. Turner, S. and Michaud, J. (2016) Sinh kế nơi biên cương: Sự thích ứng của người Hmông ở vùng biên giới Việt-Trung. 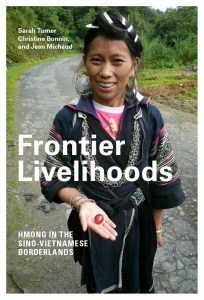 [Frontier Livelihoods: Hmong resilience in the Sino-Vietnamese borderlands]. In: Nguyễn Văn Sửu, Lâm Bá Nam, Vương Xuân Tình, Nguyễn Văn Huy (editors) Nhân Học Ở Việt Nam: Lịch Sử, Hiện Trạng Và Triển Vọng [Anthropology in Vietnam: History, Current Status and prospects]. Nhà xuất bản Tri thức, Hanoi, pp315-333. Turner, Sarah, Thomas Kettig, Đinh Thị Diệu, and Phạm Văn Cự, 2016: State Livelihood Planning and Legibility in Vietnam’s Northern Borderlands: The “Rightful Criticisms” of Local Officials. Journal of Contemporary Asia, 46 (1) 42-70. Turner, Sarah and N. Oswin, 2015: Itinerant livelihoods: Street vending-scapes and the politics of mobility in upland socialist Vietnam. Singapore Journal of Tropical Geography. Champalle, Clara and Sarah Turner, 2014: Cash Crops and Climate Shocks: Flexible Livelihoods and Food Security in Southeast Yunnan, China. Chinese Journal of Applied Anthropology, 3 (1) 47-78. Gerber, Jonathan, Sarah Turner and Milgram, L. 2014: Food provisioning and wholesale agricultural commodity chains in northern Vietnam. Human Organization 73 (1), 50-61. Rousseau, Jean-François, 2014: An imperial railway failure: the Indochina-Yunnan railway, 1898-1941. Journal of Transport History, 35:1, 1-17. Zhang Jialong, Pham T.T. Hien, Kalacska, M. and Sarah Turner, 2014: Using Landsat Thematic Mapper records to map land cover change and the impacts of reforestation programmes in the borderlands of southeast Yunnan, China: 1990-2010. International Journal of Applied Earth Observation and Geoinformation 31, 25-36. Bonnin, Christine. 2013 “Doing Fieldwork and Making Friends in Upland Northern Vietnam: Entanglements of the Professional, Personal, and Political”, pp.121-142. In S. Turner (ed.) Red stamps and gold stars. Fieldwork dilemmas in upland socialist Asia. Vancouver: University of British Columbia Press. Cornet, Candice. 2013 “The Fun and Games of Taking Children to the Field in Guizhou, China”, pp.80-99. In S. Turner (ed.) Red stamps and gold stars. Fieldwork dilemmas in upland socialist Asia. Vancouver: University of British Columbia Press. Mackenzie, C. A., B. Ricker, J. Christensen, E. Heller, E. Kagan, P. M. Osano, Lindsay Long and Sarah Turner, 2013: Dear Diary Revisited: Reflecting on collaborative journaling. Journal of Geography in Higher Education 37 (4), 480-486. Michaud, Jean, 2013: Digging up military ethnography from Upland Tonkin (Northern Vietnam), 1897-1904. Journal of Vietnamese Studies 8(4). Michaud, Jean, 2013 “Comrades of minority policy in China, Vietnam, and Laos”, pp.22-39. In S. Turner (ed.) Red stamps and gold stars. Fieldwork dilemmas in upland socialist Asia. Vancouver: University of British Columbia Press. Turner, Sarah. 2013 “Dilemmas and Detours: Fieldwork with Ethnic Minorities in Upland Southwest China, Vietnam, and Laos”, pp.1-21. In S. Turner (ed.) Red stamps and gold stars. Fieldwork dilemmas in upland socialist Asia. Vancouver: University of British Columbia Press. 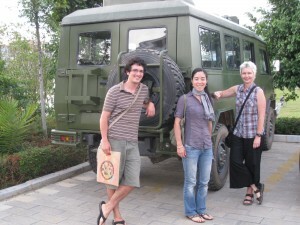 Turner, Sarah, 2013: Red stamps and green tea: Fieldwork negotiations and dilemmas in the Sino-Vietnamese borderlands. Area.45 (4), 396-402. Turner, Sarah, 2013: Under the state’s gaze: Upland trading-scapes on the Sino-Vietnamese border. Singapore Journal of Tropical Geography. 34 (1), 9-24. Bonnin, Christine and Sarah Turner, 2012: At What Price Rice? Food Security, Livelihood Vulnerability, and State Interventions in Upland Northern Vietnam. Geoforum. 43 (1), 95-105. Turner, Sarah, 2012: ‘Forever Hmong’: ethnic minority livelihoods and agrarian transition in upland northern Vietnam. Professional Geographer. 64 (4), 540-553. Turner, Sarah, 2012: Making a living the Hmong way: an actor-oriented livelihoods approach to everyday politics and resistance in upland Vietnam. Annals of the Association of American Geographers. 102 (2), 403-422. Bonnin, Christine and Sarah Turner, 2011: Livelihood Vulnerability and Food Security among Upland Ethnic Minorities in Northern Vietnam. Kasarinlan: Philippine Journal of Third World Studies. 26 (1-2), 308-314. Daviau, Steve, 2011: “Integration of a lineage society on the Laos-Vietnam border, Foucaldian analysis of State integrationist pressures, resettlement and local agency in Tarieng communities”, in Michaud, J. and T. Forsyth (eds) Moving Mountains: Livelihoods and Ethnicity in upland China, Vietnam and Laos. Vancouver: University of British Columbia Press. Michaud, Jean, 2011: “Conclusion: Lesson for the Future” pp. 215-227. 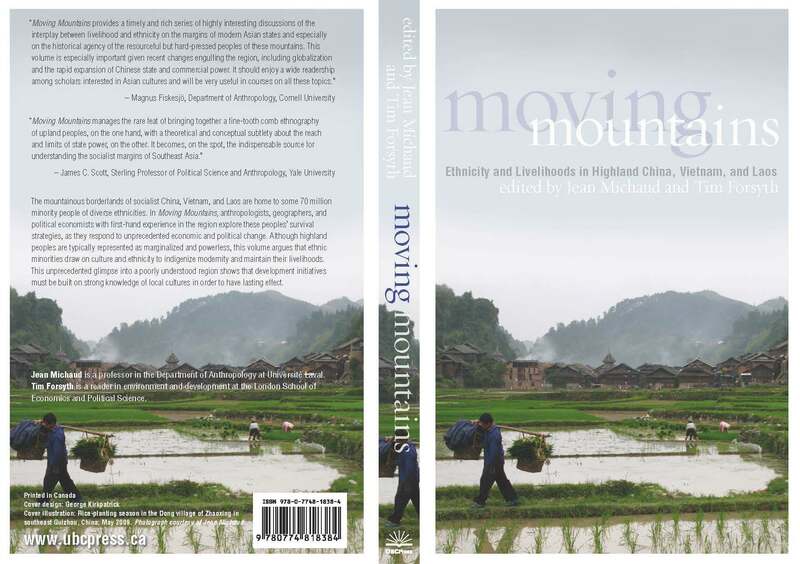 In J. Michaud & T. Forsyth (eds), Moving Mountains: Highland Livelihoods and Ethnicity in China, Vietnam and Laos. Vancouver: University of British Columbia Press. Tugault-Lafleur, Claire and Sarah Turner, 2011: Of Rice And Spice: Hmong Livelihoods And Diversification in the Northern Vietnam Uplands. In in Michaud, J. and T. Forsyth (eds) Moving Mountains. Ethnicity and Livelihoods in Highland China, Vietnam and Laos. Vancouver: University of British Columbia Press. Special issue of Asia Pacific Viewpoint, 51 (2) 2010 with numerous lab member contributors. Bonnin, Christine, 2010: Navigating fieldwork politics, practicalities and ethics in the upland borderlands of northern Vietnam. Asia Pacific Viewpoint, 51 (2). Cornet, Candice, 2010: Fieldwork among the Dong national minority in Guizhou, China: practicalities, obstacles and challenges. Asia Pacific Viewpoint, 51 (2). Daviau, Steve, 2010: Organisations à but non lucratif: timide émergence de la société civile en République Démocratique Populaire Lao. Canadian Journal of Development Studies. (30), number 3–4. Daviau, Steve, 2010: Conducting fieldwork with Tarieng communities in southern Laos: Negotiating discursive spaces between neoliberal dogmas and Lao socialist ideology. Asia Pacific Viewpoint, 51 (2). Gros, S. 2010: A Heuristic Blunder: Notes on an ethnographic situation in southwest China. Asia Pacific Viewpoint, 51 (2). McKinnon, J. 2010: Ways of seeing environmental change: Participatory research engagement in Yunnan, China with ethnic minority Hani participants. Asia Pacific Viewpoint, 51 (2). Michaud, Jean. Research note: Fieldwork, supervision and trust. Asia Pacific Viewpoint, 51 (2). Michaud Jean, 2010: Editorial: Zomia and Beyond. Journal of Global History. 5(2),187-214. 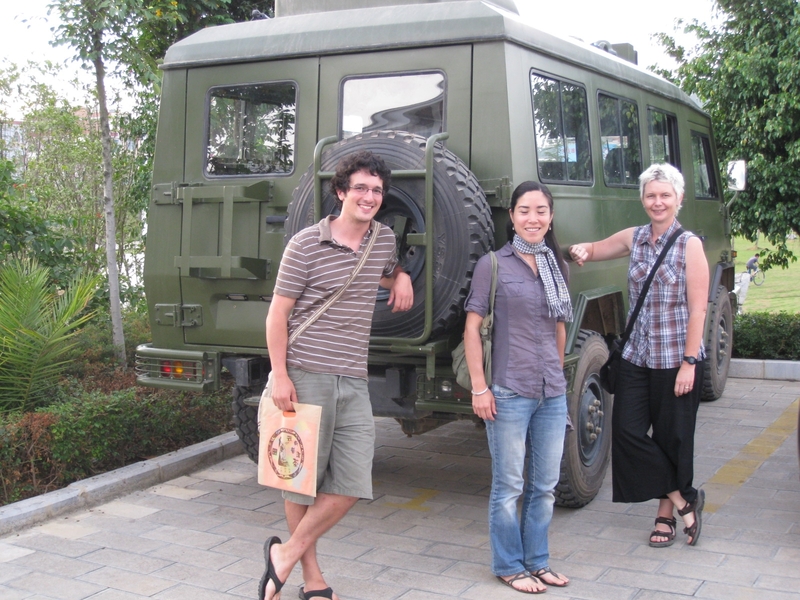 Turner, Sarah, 2010: Challenges and dilemmas: fieldwork with upland minorities in socialist Vietnam, Laos and southwest China. Asia Pacific Viewpoint, 51 (2), 121-134. Turner, Sarah, 2010: The silenced assistant: reflections of invisible interpreters and research assistants. Asia Pacific Viewpoint, 51 (2), 206-219. Turner, Sarah, 2010: Borderlands and border narratives: a longitudinal study of challenges and opportunities for local traders shaped by the Sino-Vietnamese border. Journal of Global History. (5), 265-287. Michaud, J. 2009: Handling Mountain Minorities in China, Vietnam and Laos: From History to Current Issues. Asian Ethnicity. 10(1), 25-49. Tugault-Lafleur, C. and Turner S. 2009: The Price of Spice: Ethnic Minority Livelihoods and Cardamom Commodity Chains in Upland Northern Vietnam. Singapore Journal of Tropical Geography. 30, 388-403. Turner, Sarah and Dominique Caouette. 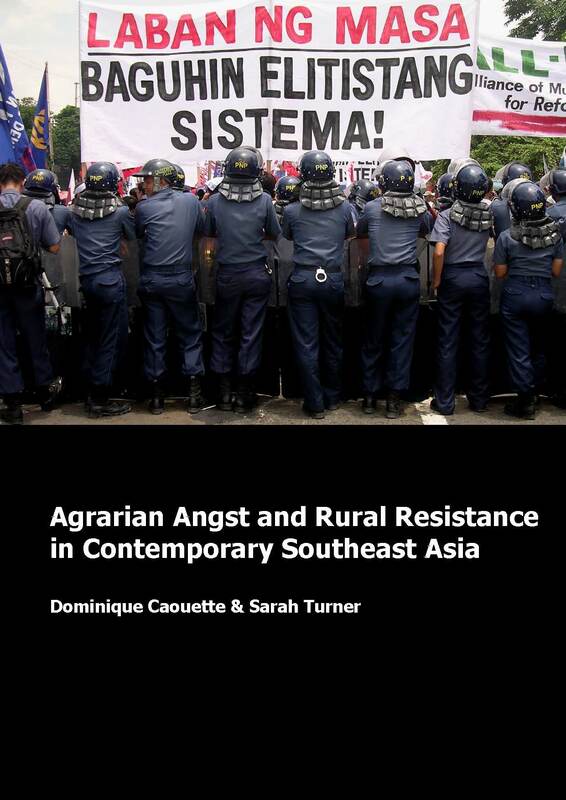 2009: Agrarian Angst: Rural Resistance in Southeast Asia. Geography Compass. 3, 950-975. Daviau, S. 2008: Kehitysen aiheuttaman uudelleenasuttamisen ongelmat Laosin kansantasavallasa (in Finnish). Ethnia: 1/2008, 23-29. Michaud, J. 2008: Flexibilité de l’économie chez les Hmong de la haute région du Viêt-nam septentrional. Aséanie. 22, 151-83. Schoenberger, L., and Turner S. 2008: Negotiating Remote Borderland Access: Small-Scale Trade on the Vietnam – China Border. Development and Change. 39 (4), 667–696. Turner S., and Michaud J. 2008: Imaginative and Adaptive Economic Strategies for Hmong Livelihoods in Lào Cai Province, Northern Vietnam. In Special issue ‘Minorities at Large: New Approaches to Minority Ethnicity in Vietnam.’ Journal of Vietnamese Studies 3(3), 154-186. DaCosta, E., and Turner S. 2007: Negotiating Changing Livelihoods: the Sampan Dwellers of Tam Giang Lagoon, Viet Nam. Geoforum. 38, 190-206. Daviau, S. 2007: Development Induced Resettlement and social suffering in Lao PDR. Indigenous Affairs, IWGIA, 4, 07:22-29. Turner, S. 2007: Trading Old Textiles: the Selective Diversification of Highland Livelihoods in Northern Vietnam. Human Organization. 66 (4), 389-404. Michaud, J., and Turner S. 2006: Contending Visions of Sa Pa, A Hill-Station in Viet Nam. Annals of Tourism Research. 33 (3), 785-808. Michaud, J. 2004: French Missionary Expansion in Colonial Upper-Tonkin. Journal of Southeast Asian Studies. 35(2), 287-310. Michaud, J. 2004: Missionary Ethnographers in Upper-Tonkin: The Early Years. Asian Ethnicity. 5(2),179-194. Michaud, J., and Turner S. 2003: Tribulations d’un marché de montagne. Sapa, province de Lao Cai, Vietnam. Études rurales. n° 165-166, janvier-juin. 53-80. Michaud, J., Turner S., and Roche, Y. 2004: Mapping ethnic diversity in highland Northern Vietnam. GeoJournal. 57 (4), 281-299. Mapping Ethnic Diversity in Highland Northern Vietnam link for maps. Michaud, J. 2000: The Montagnards in Northern Vietnam from 1802 to 1975: A Historical Overview from Exogenous Sources. Ethnohistory. 47(2), 333-68. Michaud, J. and Turner S. 2000: The Sa Pa Marketplace, Lao Cai Province, Vietnam. Asia Pacific Viewpoint. 41 (1), 85-100. Turner, S., Hardy A., and Michaud J. 2000: Special Issue. Migration, Markets and Social Change in the Highlands of Vietnam. Asia Pacific Viewpoint. 41 (1).